No-one knows quite why they exhibit this behaviour in these bays in Mexico. 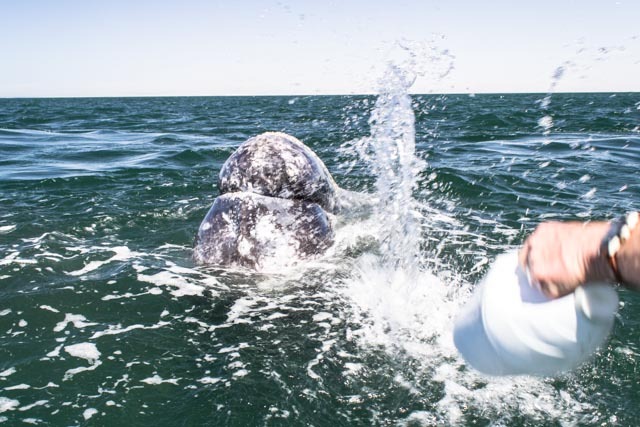 Suffice to say this is the only place where the grey whales socialise with humans – all the rest of the time they are busy with the serious business of eating or migrating. Maybe this is the creche where mama grey gives her baby swimming, breaching and spy hopping lessons. And in between, the whooping hollering humans provide some light relief for the kiddies, since they definitely enjoy stopping off with the boats while mama watches on patiently. From time to time a mother will also approach the boat for a close encounter – and to scratch the side of a creature that could crush you with a swipe of her tail, is awesome. 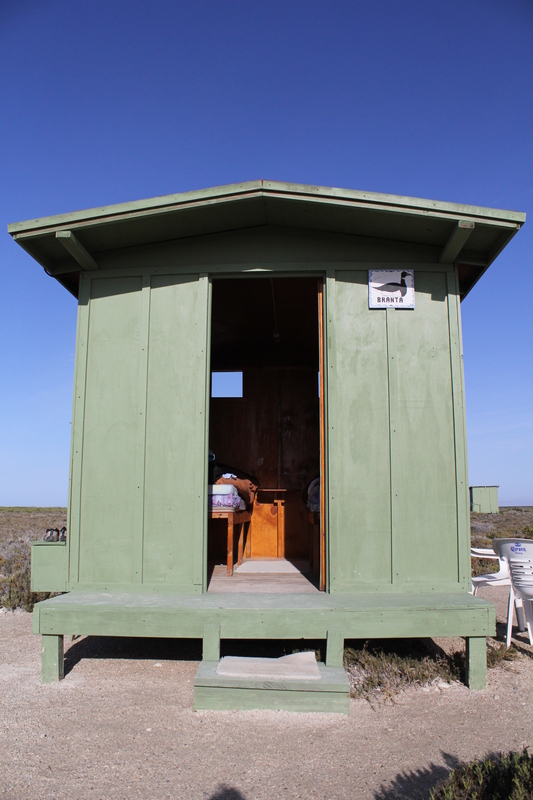 Our base is Campo Cortez on the San Ignacio Lagoon. 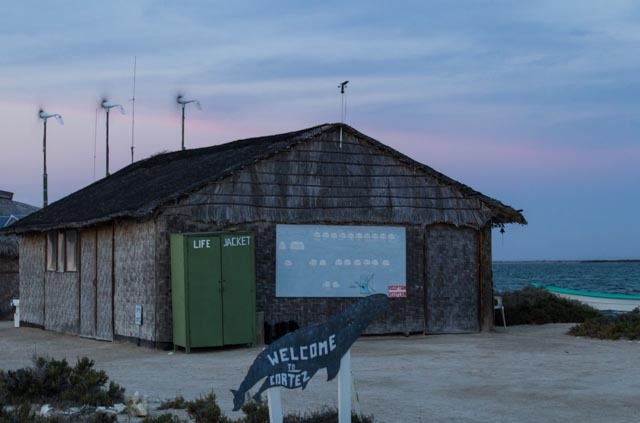 The Campo is certified eco friendly; they recycle everything, have eco toilets which flush with salt water and use solar and wind to power the entire site. We glamp – the camp consists of about 20 cabins with two bunks supporting mattress and sleeping bags. The nights are incredibly cosy inside the warm cocoon of the bags – a good thing, since we are in a desert and the nights are characterised by a chill wind that blows through you when you are outside. Showers are rationed to one every two days, and happen quickly; not enough water for long hot drenchings. Wet. soap. rinse. Each day the routine is the same. but the experience is totally different; we have a hot breakfast at 08.00 consisting of something plus refried beans and tortillas – the something is usually scrambled eggs. Lunch at 12.00 is something plus tortillas; could be soup, fish, chicken stew or refried beans. Margarita time rolls around at 17.00 served with corn chips. guacamole and salsa. Dinner is served at 19.00 and is something plus tortillas and refried beans. 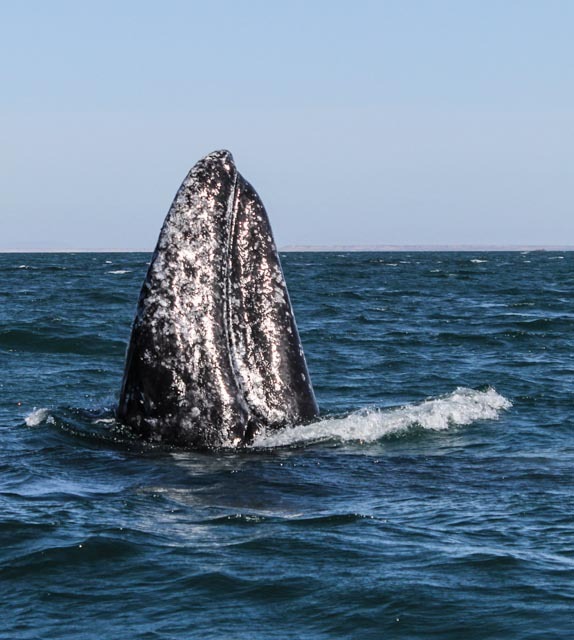 There are two whale outings a day, 08.45 and 13.45 each about 90 minutes long. We motor to the mouth of the lagoon where the observation area is – all other areas are out of bounds. 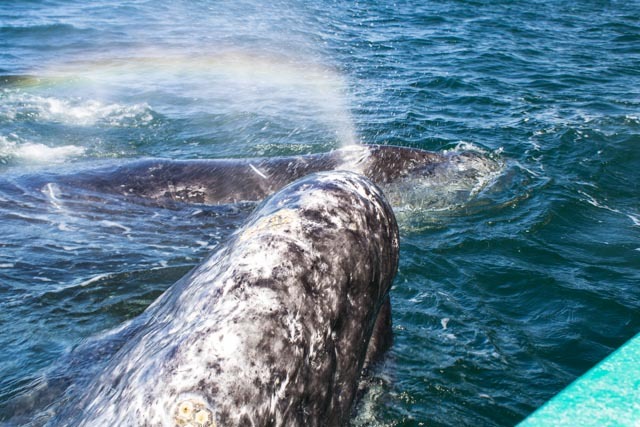 If the whales genuinely had no interest, they could easily avoid us, but more often than not they choose to hang with the boats, sometimes as little as 20 seconds, and others as long as 20 minutes. When we get a “friendly” they get shared around several boats, so that the most people can have an experience with them. If a boat manages to attract the attention of a pair, or sometimes more, then other boats come and muscle in, which we call “sharking”. 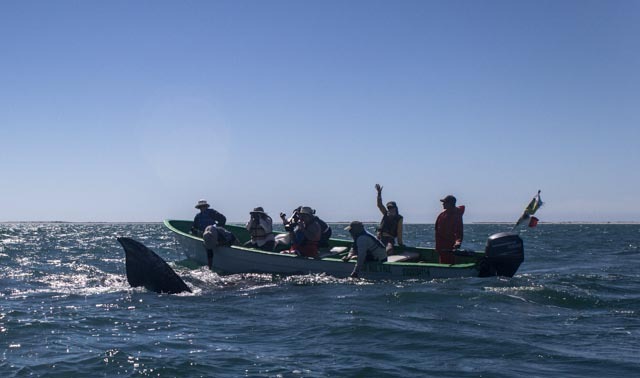 Sometimes we do it to others, and that’s ok.
Our group soon becomes the firm favourite of both whales and Campo staff – our enthusiasm is expressed as loudly as is possible, which the whales find interesting and the humans amusing. Making a lot of noise and splashing lots of water works – we become expert at attracting the interest of the greys on all the days that they are willing to play. At one point, we passed over the baby we had been amusing to another boat, but they all sat there with nary a peep out o the lot of them , and you could tell the whales were getting bored. So we set to whooping, yodelling, ayayayayayaying, and generally making an earsplitting racket and the pair came right on back to us. Every outing is different. The first few days we had encounter after encounter, with babies and mums stopping to chat and scratch. On several occasions they even pushed our boats, almost like we are a floating toy. On one session we had about 50 spy hops happening all around us, about 10 of which were no more than 5 meters from the boat. Another day we must have had 10 mums and bubs around and between the dinghies – I could almost have walked over them to the next boat. A couple of afternoons they seemed more engrossed in swimming lessons, despite all the noise and splashing we did – but then we were graced with one baby that would veer off in our direction to have a quick play, before catching up with mum. One little boy spent 10 minutes doing rolls and showing us his belly while his mum lay belly up beside us. 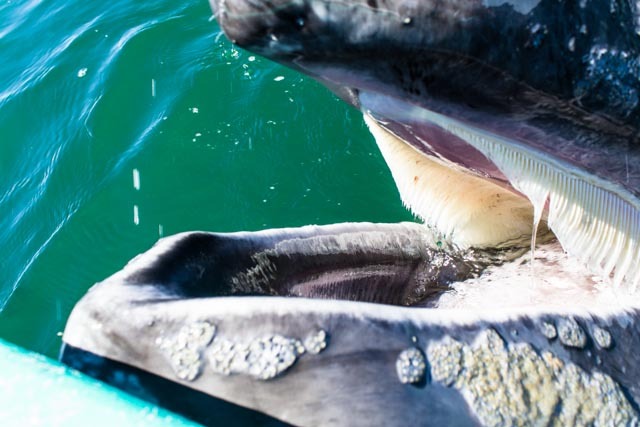 One decided he wanted some dental treatment, opening his mouth wide and getting his baleen and tongue scratched – by me!!!!!! 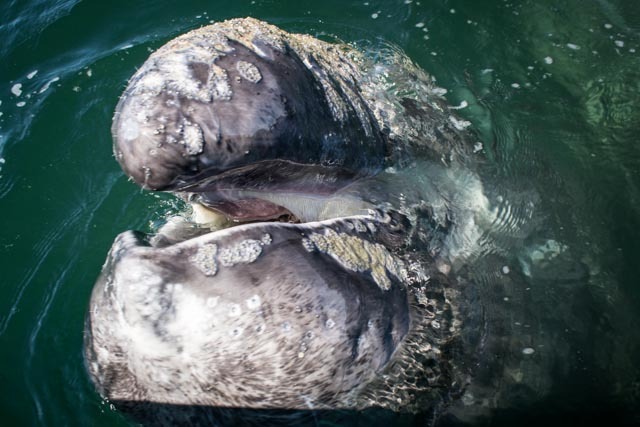 Their tongue feels just like mine, just bigger; their skin feels like velvet stretched over hard rubber – incredibly soft where it’s not covered in barnacles. 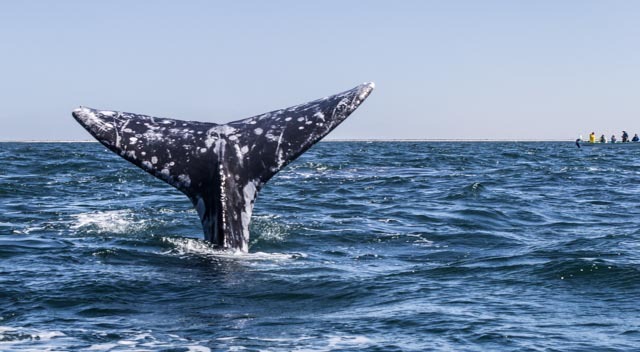 One can tell the whales apart by a number of things – number and distribution of barnacles, by the pattern of orca bite marks on their skins. fins and tails, and by their colouring. I can’t help wincing when I see the barnacles as imagine what it would be like to have something burrow itself into the skin and build a shell on me. Ugh. They also suffer from marine lice – little crab-like creatures that will jump ship onto humans if they can. I managed to avoid picking them up. 7 days, thirteen outings, and I cannot say I am tired of the experience. After all it’s not every day I get the opportunity to socialise with one of the largest beings on the planet – gentle giants who rise up out of the blue to examine me through large, intelligent blue eyes.